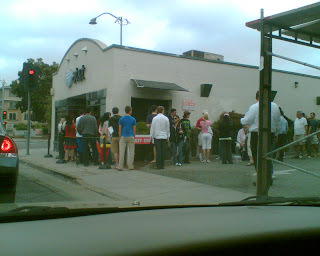 (People lining up to buy the new iPhone in Palo Alto on Monday, July 6). A quick post on my impression of America's economic health and the mood there after my first vacation stateside in quite some time. Signs of the housing slowdown are everywhere. However, I do not have the impression at all that America is on the brink of a major recession, let alone a depression. People remain prosperous, friendly _ hardly anybody I talked to seemed gloomy about their economic situation. The Wal-Mart was teeming with people. Take that as a good sign or a bad sign, since it shows economic activity but also implies people are trying to save the maximum amount of money. I did see the following irresistible item on the rack there and had to buy it. Discounted from $4.73 to $3.00 _ that's EUR1.92 for a gem like this! And Amsterdam is beautiful again, although apparently I missed a cold wet and lousy Dutch July. Did you like coming back to the Netherlands or did your stay made you want to return to the States again? My sister, who's been living in Los Angeles for 12 years now, is always a bit relieved wehen she returns to the States. She likes coming back to Holland mostly because of her family and friends here but she doesn't want to live here anymore. At least not in the near future. Well, we arrived back in the Netherlands it was a rainy Monday that felt like midwinter. However, that's just an incident. The deeper answer to your question is: I don't know. I loved California _ but of course I was on vacation. And for the first time, in fact, it didn't feel like home. I've been planning to move back for a while now, but...just not sure. I really hope that above photo of the AT&T at El Cam/Page Mill wasn't from July 6 because that was about a week before the iPhone was released (July 11). Freakin' maniacs. In related absurdities, the lines have continued for over 3 weeks now. I blogged something last week about Apple being ill equipped to handle all the sales. I also went by the SF Apple store last Friday morning (Aug 1) and snapped this photo @ 8:15AM of people still waiting in 4+ hour lines. [ http://www.flickr.com/photos/petechen/2732670871/ ]. Insane. you'd think these people would agree to communism if Steve Jobs were made Communist Party Leader. Glad you enjoyed your visit "home" - things in PA they are always a-changin. @Pete _ I can't pin it down, so July 11th has to be the operating assumption. Photo was taken, ironically, with my crappy cell phone camera which didn't time-stamp the picture.